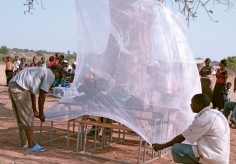 Using a mixed-effects regression model, we quantified the relationship between malaria vector control, other priority health interventions, and socioeconomic indicators and district-level under-5 mortality trends from 1990 to 2010. We then conducted counterfactual analyses to estimate under-5 mortality in the absence of scaling up malaria vector control. 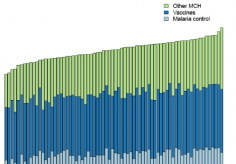 Throughout Zambia, increased malaria vector control coverage coincided with scaling up three other interventions: the pentavalent vaccine, exclusive breastfeeding, and prevention of mother-to-child transmission of HIV (PMTCT) services. This simultaneous scale-up made statistically isolating intervention-specific impact infeasible. Instead, in combination, these interventions jointly accelerated declines in under-5 mortality by 11% between 2000 and 2010. 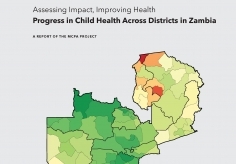 Zambia’s scale-up of multiple interventions is notable, yet our findings highlight challenges in quantifying program-specific impact without better health data and information systems. As countries aim to further improve health outcomes, there is even greater need – and opportunity – to strengthen routine data systems and to develop more rigorous evaluation strategies.